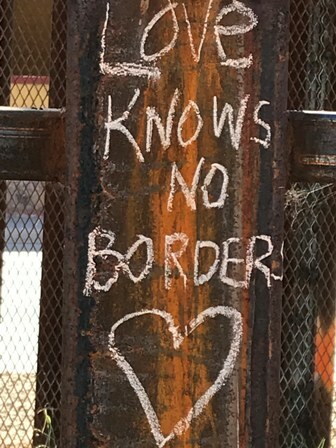 November 19, 2018, Nogales, Arizona – While the first full day of the School of the Americas (SOA) Watch was a time of exploration and of in-depth study of the issues and conditions that have led to so much suffering at the U.S.-Mexico border, the Western Hemisphere, and the world, the closing day on November 18 brought a different set of experiences and emotions. The final day – with events exclusively at the U.S.-Mexico border and the wall between Nogales, Arizona, and Nogales, Sonoma, Mexico – wrapped up the weekend with impassioned speeches and music crying out for justice; a bilingual litany of the injustices suffered primarily in the Western Hemisphere. For more than an hour, groups gathered on both sides of the border listened as the names of those who lost their lives because of U.S. policies in Latin America were announced. To call the people to be present in sacred space through the crowd responded, “Presenté!” Finally, the activists celebrated their hope for a better future with a performance of life-sized Puppetistas portraying an imperialist dictator, the Border Patrol, and monarch butterflies – the quintessential migrants of nature. Sister Kathleen Nolan, OP, Coordinator of the Office of Justice, Peace, and Integrity of Creation, organized the participation of a contingent of Adrian Dominican Sisters. Attending with her were Sisters Joan Baustian, OP, Maurine Barzantni, OP, Janice Holkup, OP, Barbara Kelley, OP, and Susan Van Baalen, OP. “The litany of disappeared and deceased was longer than usual and was rendered beautifully by the way the names were proclaimed,” Sister Maurine said. The names read were primarily been of people who were found dead in the Arizona desert while trying to migrate into the United States. Especially moving for many of the Sisters was the fact that many of the people who had died were identified in the litany as “unknown male,” “unknown female,” or “unknown person.” In many cases, the names and ages were called out, demonstrating how many people had died at a young age. The litany depicted the loss of thousands of individuals not only through the calling of their names. Sister Janice said she was impressed by the paintings of many of the deceased – and by the re-enactment on the Mexican side of the border of their deaths. “As they read out the names of the people who had died, people lay down as if dead,” she recalled. Sister Susan was also impressed by a new incorporation of a Jewish tradition: placing rocks on the graves of loved ones to show that the deceased had a visitor. Those at the rally were encouraged to find a rock and place it on the fence in front of the wall, as a symbol that the people whose names were called are not forgotten. But while the reading of the names was sobering, the Puppetistas brought a spirit of hope and celebration to the closing of the weekend. Both Sisters Joan and Maurine marveled at the use of the monarch butterflies – symbols of migration but also of Mexico and the rest of Latin America. In one telling moment of the presentation, the butterflies overcame the figure of the dictator. “I think it’s [a symbol that] goodness defeats evil – or that gentleness can overcome force,” Sister Maurine said. November 18, 2018, Nogales, Arizona – The first full day of the 2018 School of the Americas (SOA) Watch Encounter at the Border was, in the words of Sister Janice Holkup, OP, more like two days. It was a day of both intense emotions and intense learning about the many barriers that are intentionally erected between communities by people in power. Sister Kathleen Nolan, OP, Coordinator of the Adrian Dominican Sisters’ Office of Justice, Peace, and Integrity of Creation, organized the participation in the Encounter at the Border of six Sisters from the Congregation: Sister Kathleen and Sisters Joan Baustian, OP, Maurine Barzantni, OP, Janice Holkup, OP, Barbara Kelley, OP, and Susan Van Baalen, OP. The Sisters began their day of discovery by visiting the border of the United States and Mexico, marked by a miles-long, 18-feet-high wall topped by razor wire and surrounded by mesh – to prevent people on either side of the wall from reaching through the parallel metal slats that separates the U.S. and Mexico. At several points along the way, people are prevented from getting close to the wall by a second lower fence. “It seemed unreal even though it was real,” Sister Janice said. “It was such a shock to see the immensity and the physicality of the wall running right down the middle of the street, dividing neighbors.” The wall divides into two what had been one city with open national borders – Nogales, Arizona, and Nogales, Sonoma, Mexico. The visit to the wall shocked both the Sisters who had never been to the Arizona-Sonoma border and the Sisters who had attended the SOA Watch Encounters at the Border in previous years. Just a year ago, people could stretch their arms through the space between the slats and make a physical connection across the border. The addition of the mesh, the second wall around the wall, and the razor wire made even that physical connection impossible. However, Sister Susan witnessed a hopeful activity that proved that even a wall such as this could never fully divide people. She described an activist on the U.S. side, after several attempts, lobbing a small piece of candy over the wall, where it was picked up and enjoyed by a man on the Mexican side. 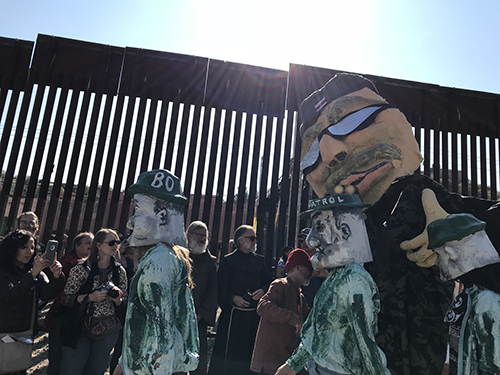 The Sisters balanced the physical and emotional experience of visiting the wall with an afternoon of workshops to add to their understanding of the situation at the Mexico-U.S. border and throughout the world. Workshops focused on topics such as the connection between the U.S.-Mexican border and the border between Israel and Palestine; the witness of families whose loved ones disappeared after crossing the border; arms trafficking from the United States to Mexico; and the “search and rescue” service of non-profit agencies in Texas and Arizona that help families whose loved ones went missing after crossing the border. The workshops pointed out to the Sisters the systematic use of surveillance to control people seen as “the other.” Sister Kathleen noted that in one workshop she learned that Israel’s technique of surveillance of the people of Palestine has been used as a model for the U.S. surveillance of the border – and that this has created a new business. “Fifty surveillance companies now exist in Arizona as a result of this strategy,” she said. The situation of migrants who try to get into the United States through the desert areas of the southern states was a major topic of the workshops. Sister Susan was struck by the enormity of the deaths that take place at the border between the U.S. and Mexico: 8,000 deaths across the southern U.S. border in the past 20 years. But non-profit groups and volunteers strive to help the migrants to survive their journey by putting out barrels of water along the way. In discussion of what they had learned that day, the Sisters saw humanization as the key to improve the situation along the borders. It is only through dehumanizing or demonizing the migrants, for example, that some Border Patrol agents could have emptied the barrels of water set out to help the migrants – or slash the barrels so that they could no longer be effective. November 17, 2018, Nogales, Arizona – When Six Adrian Dominican Sisters left their homes Friday in Adrian and Warren, Michigan, and Seattle, Washington, they knew they were not only heading to Nogales, Arizona, on the border of Mexico. They knew that their participation in the annual School of the Americas (SOA) Watch Encounter at the Border would take them to an experience of solidarity with immigrants striving to come into the United States – and often being deported or held in detention centers. This is the third year Adrian Dominican Sisters have attended the event at the border, said Sister Kathleen Nolan, OP, Coordinator of the Adrian Dominican Sisters Office of Justice, Peace, and Integrity of Creation, and who coordinates the effort. Attending with her this year are Sisters Maurine Barzantni, OP, Joan Baustian, OP, Janice Holkup, OP, Barbara Kelley, OP, and Susan Van Baalen, OP. The Adrian Dominican Sisters began their participation in the Encounter at the Border on the evening of November 16 at a vigil in the Arizona desert outside of an immigration detention center in Eloy, Arizona. Talks, music, and poetry called attention to the presence of the privately-owned detention center, where immigrants are held indefinitely. The vigil was established as a time of prayer for those who are suffering; the desert land on which it was held was acclaimed as sacred. Dévora González, field organizer for SOA Watch, thanked participants for coming and for standing in solidarity with the immigrants who are held at the detention center. She spoke of the importance not only of calling attention to the detention center, but also of speaking out against the pain, suffering, and death caused by the militarization of the border. A young woman who had been detained at different times at the Eloy Detention Center spoke of her own experience. During her most recent stay, she said, she had little or no access to the warden and no way of knowing if her requests for services were received by the staff. Health care was difficult to access, she said, because those who requested it were expected to stand in line beginning at 4:30 a.m. During her time there, she said, her connections with the world outside were the moon and the presence of an owl, which reminded her that her ancestors were watching over her. The Adrian Dominican Sisters spent time after the first event, reflecting on its impact. “It’s important to come, but there’s a sense of futility about it, too,” Sister Kathleen said. “How many people have to die in the desert? What does it take for people to treat other humanely?” However, she and Sister Maurine also felt encouraged by the large presence of young activists at the rally. The Sisters also discussed the importance of attending events such as the Encounter at the Border. “Seeing the detention center was important and realizing that they [the detainees] could hear us if we were loud enough was important,” Sister Janice said. “Something like this energizes me,” Sister Joan said. 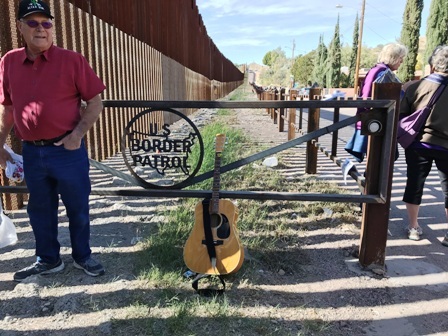 Events on Saturday, November 17 – the first full day of the Encounter at the Border – will bring a Veteran’s March to the Mexican Border; a rally; workshops on both sides of the border; a concert; and a vigil. Feature photo (top): Four of six Adrian Dominican Sisters who are participating in the School of Americas Watch Encounter at the Border in Nogales, Arizona, pause for a photo prior to a vigil near Eloy Detention Center. From left are Sisters Maurine Barzantni, OP, Janice Holkup, OP, Susan Van Baalen, OP, and Joan Baustian, OP. Also representing the Congregation are Sisters Barbara Kelley, OP, and Kathleen Nolan, OP. Alajandra, who spoke to us, is facing deportation. Activixts are working for a pardon from the governor . One of the groups present in large numbers. was veterans for peace. They are working to stop the deporting veterans. white house. Others also promised to support this.